could't get datasaver nor table.save to work? is there something I've missed? Sorry if this already asked before. Im creating non commercial children educational game on android. I'm trying to save player progress in a form of star-score much like angry birds. Basically on each level icon I put stars indicating how well the player went through that level. Its okay when the app is still playing. But whenever I exit the app. reset (or clear ram). When I get back to the app, all of those progress are gone. I've tried both table.save and datasaver with no success. On device player testing failings, also I try converting them to apk file and make sure the permission to external storage available, still failing. whatever I tried it just not working. I'm a newbie in gideros and lua, so perhaps its just a silly mistake or simple step that I missed? @widhi_muttaqien yes, you are trying to save in resource directory (the same directory where all you assets are), but this directory is read only and thus can't create or write to files. Note: |D| at the start of the file name, that indicates Documents directory. oooh so thats the problem. Thank you so much arthur. how can he manage not using |D| ? Is testing on device using gideros player allow us to save on local storage? Or should we build .apk file first to test it? 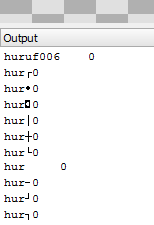 hmm, still not working with "|D|", I dont know why.. I tried on device, desktop even on android apk build. @widhi_muttaqien ah sorry for confusing you. it should actually work without |D| because of loadValue and saveValue methods, already internally use on single file inside Documents directory. If you would be using load and save to store in separate files, then you would need to specify directories. In your case it seems that something overwrites the values or clears those files on each run. You could try opening Documents directory on your OS file system and see if everything you wanted to save is actually there. @widhi_muttaqien aha I see, it is a problem of json class. I just fix my app!! wow!! I dont use huruf001 instead I use hurufSatu etc (its indonesian). Basically not using any numbers in a key name. So its a json problem, I see. I also fix the json class with the quick fix on that discussion just in case. Thank you for your support arthur! !